Evolve is an online first person shooter, where appears combined cooperation and competition between players. The originators and creators of the game are known mostly thanks to a popular game Left 4 Dead (prepared in partnership with the Valve Company). Evolve is set in the future and tells the story of hunting monsters. The game has several modes of play, but in its basic form there are four mercenaries who fight with the beast. The beast is the fifth player. It is important that hunters have been described according to strictly specialized classes – there are involved in the hunt: trapper (or hunter), assault, medic and support unit. In the game there are also a few representatives of the class creatures, which you can play - each of them has a unique appearance and skills. One of the easiest to learn monsters is Goliath. It is something like King Kong with a fiery breath. The matches are different from what we know from the typical shooter game – the game is asynchronous and unique for each player. The hunters' team begins for example from tracking monster – and this is a trapper's specialization. This mercenary can lay out the sound probe, restrict movements of the enemy using a harpoon, or imprison him inside the force field temporarily. After fixing the position of the victim, the team must cooperate together - medic should heal, support unit should renew shield of companions and a assault has to attract the attention of a dangerous beast. In this part of game cooperation between players is important. The situation looks completely different from the monster side. At the beginning of the game it has to flee from people who seek him and hunt animals and eat their meat. Only in this way the beast increases the chances to win the game - after consuming a right portion of carrion it may evolve into a stronger character. Then the player receives more points and the ability to choose the next special attacks. Animals which wander around maps can be also useful in other ways – they guarantee bonuses and take part in combats. It's an internet game and it has all the typical elements like similar games, including the ability to unlock new mercenaries, monsters and items. Neither flora nor fauna are friendly on planet Shear. Fall victim to natural hazards or use them strategically against your prey. Level up to unlock new upgrades, skins and perks for your favorite class: hunter or monster. Earn your infamy on the leaderboards and become the apex predator. From the technical point, the game runs on CryEngine and looks good. Attention should be especially paid to interesting design of characters and monsters. 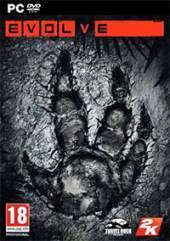 On July 7/2016, the game was made free to play as Evolve: Stage 2 with improvements across-the-board including improved matchmaking, enhancements to all characters, visual improvements to maps, optimized performance, and improved player experiences. On Sep 3/2018, dedicated servers will shut down, Evolve Stage 2 will no longer be available, and in-game store will no longer be available. Peer-to-peer multiplayer will still be available in Legacy Evolve as well as any DLC bought previously.